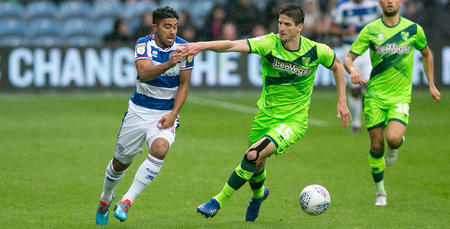 IAN Holloway enjoyed a winning return to the QPR dugout, after Rangers recorded a 2-1 Sky Bet Championship victory over ten-man Norwich City at a packed Loftus Road. Visitors City played almost the entirety of the game a man light, following Martin Olsson’s second-minute dismissal for handball in the box. Tjaronn Chery missed the resultant penalty – but Rangers would make the numerical advantage count with two goals before half-time. First, Conor Washington struck following Seb Polter’s knock-down from a corner, before Polter got himself on the scoresheet when Chery’s sublime pass put the forward clean through on goal. In the second half, Steven Naismith’s 78th-minute reply for the Canaries resulted in a grandstand west London finish. However, City couldn’t score again to dampen Holloway’s homecoming, as the R’s held out to halt a run of seven games without victory against Norwich. Loftus Road was awash with noise as Holloway and first team coach Marc Bircham were introduced to the W12 faithful before kick-off. And the volume was cranked up another notch when Rangers won a penalty with less than a minute on the clock. Jack Robinson’s long throw into the box sparked a real scramble and, when Hoops skipper Nedum Onuoha attempted to prod over the line, Norwich’s Olsson appeared to handle to prevent the ball from going in. The referee duly awarded QPR the spot-kick, showing the City full-back a straight red card in the process. However, unfortunately, Rangers couldn’t take advantage immediately when the penalty was taken in the third minute. 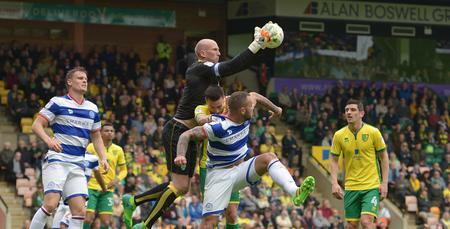 Chery missed the 12-yard kick, shooting past goalkeeper John Ruddy’s bottom left-hand post. But the R’s would eventually take the lead, opening the scoring in the 21st minute. Excellent work by Robinson saw the QPR defender do well to win a corner and, when Chery delivered the resultant set-piece, Polter’s knock-down was fired home by Washington. 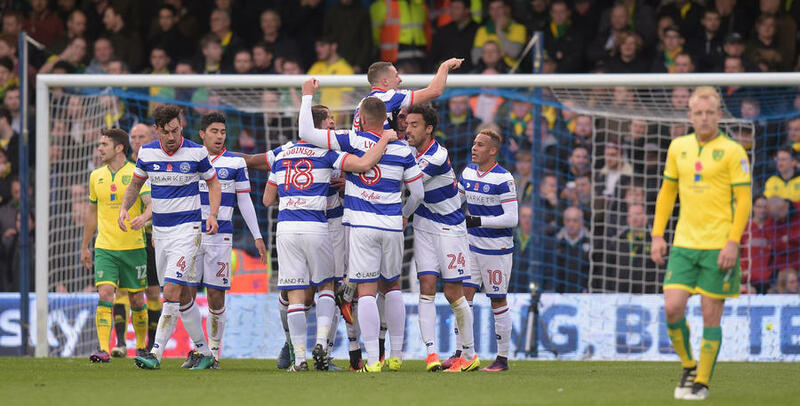 Lift-off at Loftus Road – and it was almost 2-0 four minutes later. Washington turned provider, supplying a pinpoint, right-flank cross that was met by Polter, whose subsequent header was blocked away for a corner. However, the lead would be doubled, as Rangers struck again in the 27th minute. What a lovely goal it was. Chery deserves just as much credit as the scorer, as it was his delicious slide-rule pass that put Polter in the clear. And the German didn’t disappoint thereafter, remaining calm and collected to slot the ball in past an advancing Ruddy. Chances were few and far between for the rest of the first half, though it was Holloway’s revitalised charges who continued to pose the greater attacking threat as they searched for a third goal. Rangers made a change at half-time. Robinson - who appeared to pick up a knock before the break - was replaced, with Sandro taking his place. That substitution also saw QPR adopt a 4-4-2 formation, after operating in a 3-5-2 in the opening period. Much like the first half, the R’s enjoyed the better of things after the interval. Rangers fashioned their first attempt of the half in the 58th minute, as Chery’s driven effort whistled just past the right-hand post. Four minutes later, meanwhile, only a fine save from Ruddy denied the home side a third. Washington latched onto a misplaced pass and when he advanced into the area, the striker’s thumping low effort was tipped around the post by the goalkeeper. Holloway opted for a second R’s sub in the 66th minute. Massimo Luongo made way for Olamide Shodipo. Three minutes later, another chance arrived for the hosts. Grant Hall’s header was clawed away by Ruddy, following Chery’s left-wing corner kick. Norwich rattled the crossbar through Jacob Murphy in the 72nd minute, after the academy product’s spectacular effort from 25 yards. To their credit, City got better as the half wore on and, in the 78th minute, pulled a goal back. Unmarked, Naismith headed home from six yards, after Jacob Murphy crossed from the left. A nervy finale awaited. Rangers’ third and final change came in the 81st minute, as Idrissa Sylla replaced Polter. As expected, the final minutes were tense. But, thankfully, despite Norwich probing until the death, the R’s managed to hold on to their lead. Two-one to the Super Hoops – and a happy homecoming for Holloway. 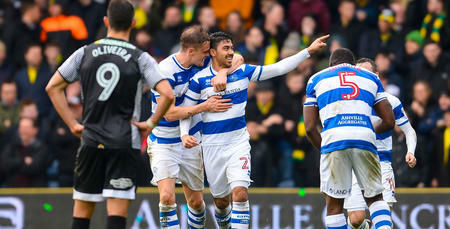 WATCH all the action from Ian Holloway's first match in charge at Loftus Road against Norwich City.